Yep! I heard it!! While celebrating my 55th Birthday - that phrase "she's no Spring Chicken" was uttered! Too late - they couldn't take it back. I really took it to heart - or I should say - I took it to the table! That was the inspiration for my Spring Chicken Tablescape! So here are a couple of old hens pulling off the Spring Chicken look. It is fresh bright yellows and lots of crisp whites. I like the way the whole room looks bright and ready for spring. The only thing new here on this table are the patterned yellow salad plates from Pier 1 Imports. I love them paired up with the checked border plates I bought several years ago. I wish I had real forsythias to use for this table, but since we still have a few remnants of snow hanging around, my forsythia bush isn't even close to blooming yet. I had to settle on using faux stems. These little guys just had to crash the party! So, Spring Chicken or not - I think I showed them I still have a few moves left in me! We welcome any kind of Spring around here, chickens or otherwise! I'm certainly no spring chicken, but I'd sure like to dine at this darling table. Love the sunny yellow! I admired those plates at Pier I. They look terrific on this table. Happy Birthday! 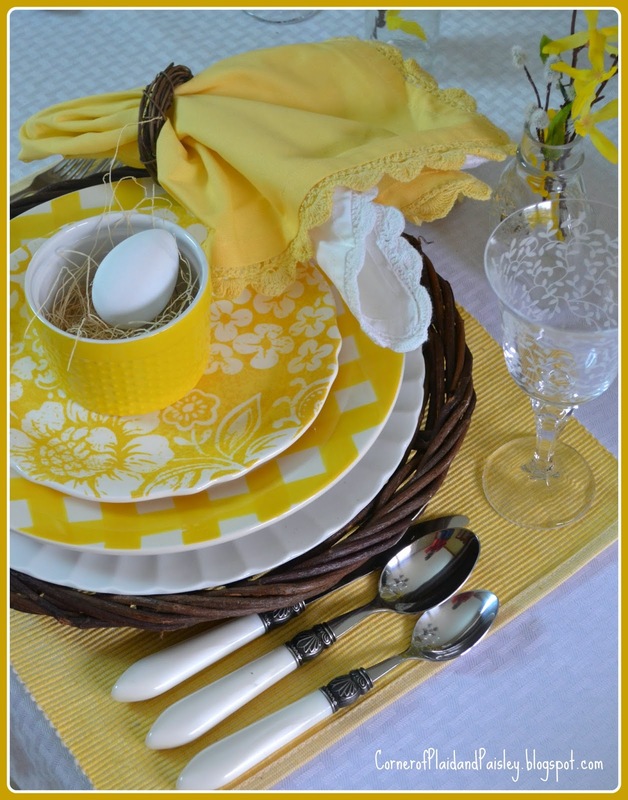 Oh Ann, I just came back from Inspire Me and your table setting is gorgeous with in all yellow, and perfect for spring! I'm pretty sure I have the same salad plates, except my set of dishes come in four colors, including the yellow...if you have a chance you can check mine out and see if they are the same! Happy birthday sweet friend and many blessings for your new year of live and always! A breath of spring air...beautiful, Ann. Too adorable!!! Love your spring chickens, just makes me smile! And the cheery yellow and white, soooooo fresh and cute Ann! 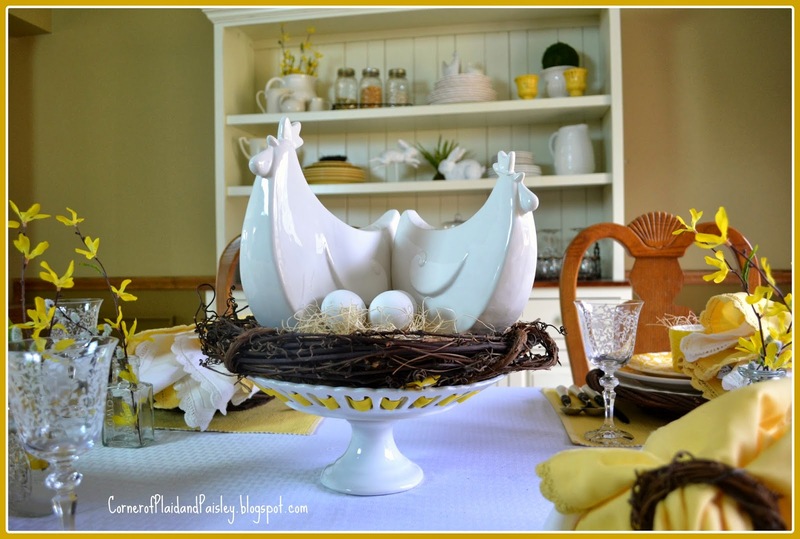 I love that nest centerpiece with the roos and chick...by the way, they're awesome! Yeah, I did a serious check of our plates, but boy, they must be from the same make. My entire everyday china has a Brand of the store they have them put specially for them, I guess, therefore, I don't know where they come from! Anyway, both patterns are so pretty, right? I love your Spring chicken table! The colors are so vibrant. A very happy table. I love the pairing of the 2 salad plates! Boy someone would get their toes stepped on for saying that around me!! I'm 2 years older than you officially this Monday! That's too cute how you came up with the two chickens for your theme. 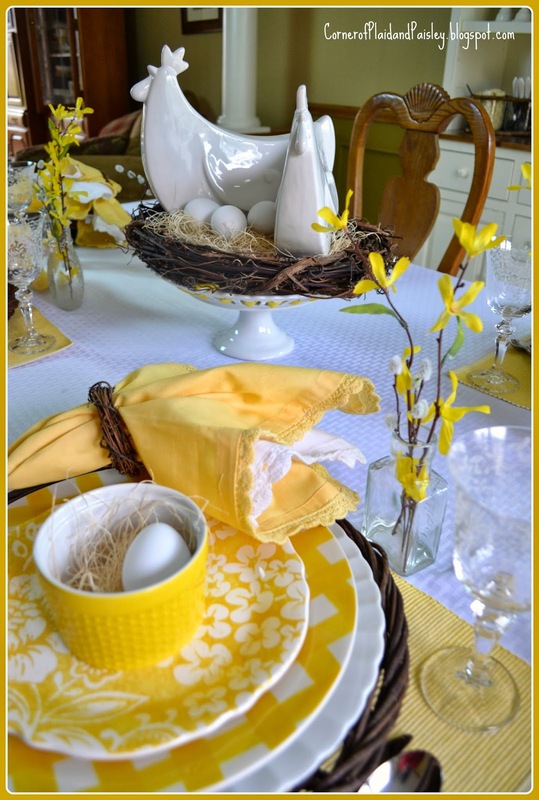 Your table speaks spring like crazy- love the yellow! Happy Birthday! Isn't it fun to make lemonade from lemons? Your inspiration, though a tish insulting, is brilliant! I love your table, the new plates (and the old), your chickens and eggs. Everything is so cheery and springy and fun! I enjoyed seeing pictures of your hutch, as well. Your room is beautiful. Enjoy! I love this! 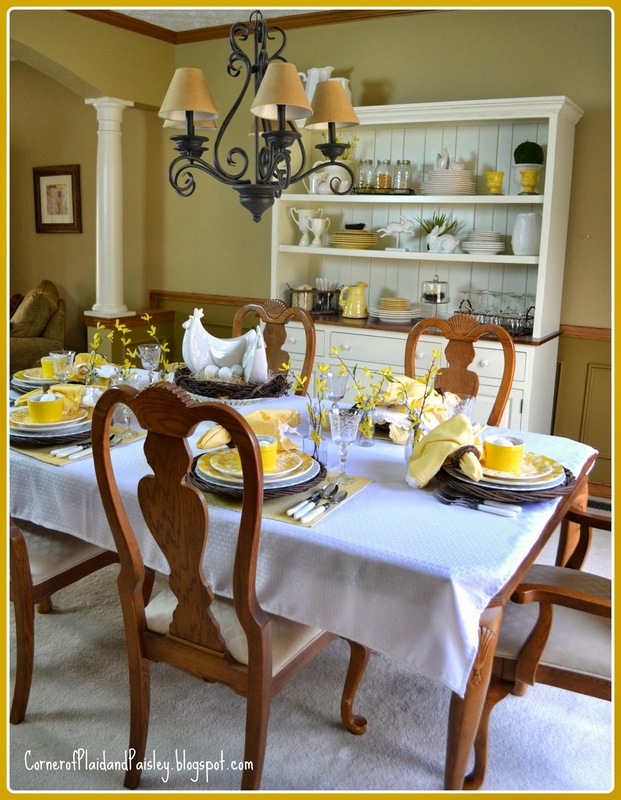 The yellow color scheme is great and very cheerful and springlike. Laughed and laughed with you on this. My doctor always says, "Well, you are getting to that age". What, what age is that, sir???? All right, I am getting to that age, but you have turned that lemon into a fabulous lemonade of a table. Love the chickens and all of the beautiful yellow. It is so sunny and happy. None of us can feel old looking at this one, Ann!! I am so in love with this beautiful yellow and white table. 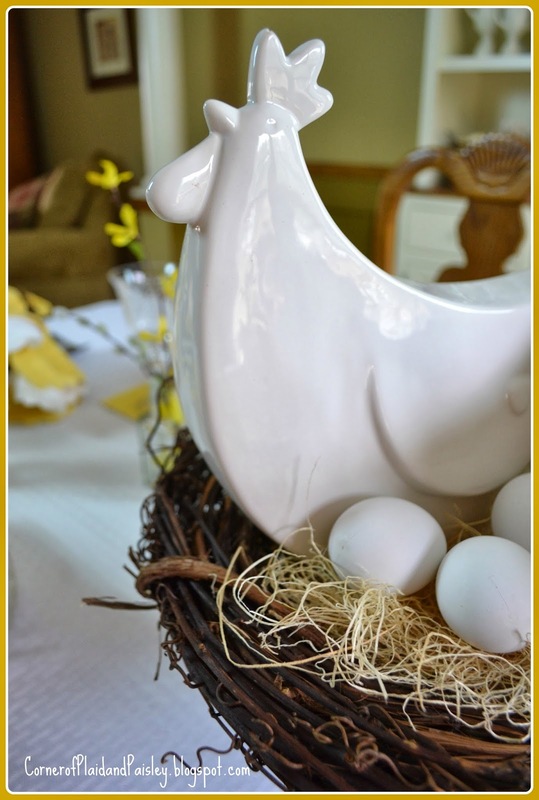 The "old" hens look as if they are enjoying themselves presiding over this wonderful cheerful tablescape. Right on, sister! Right on! We may not be a Spring chicken, but we sure know how to live!!! And how to do a Spring table!!! Wow, Ann...this is beautiful! It's definitely bright, full of color and life, and the pattern mix is GREAT!!! I love the 2 plates!!! We still have snow going on here, too, as of yesterday. There won't be anything in bloom for awhile. 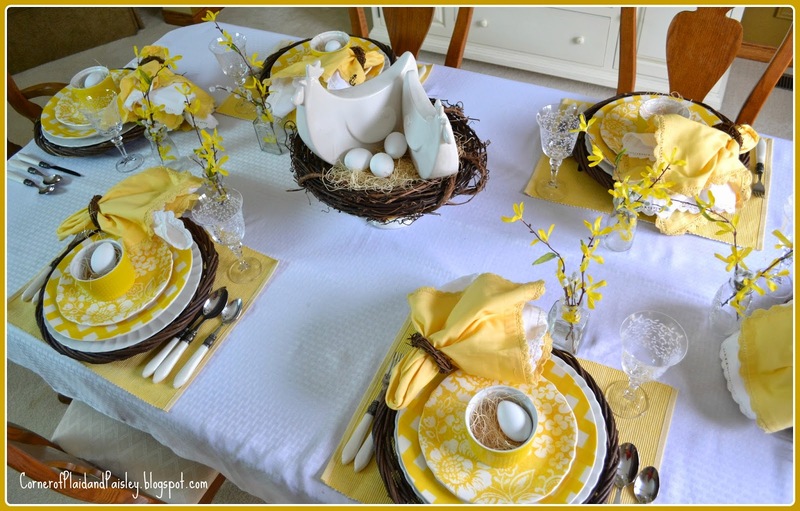 Whether the forsythia is real or faux, it sure added a nice touch to each place setting! Humorous AND pretty!!! Way to go, girl!!! What a lovely inviting table. Very Spring-like. Ann, your table reminds me of sunshine and warmer days. 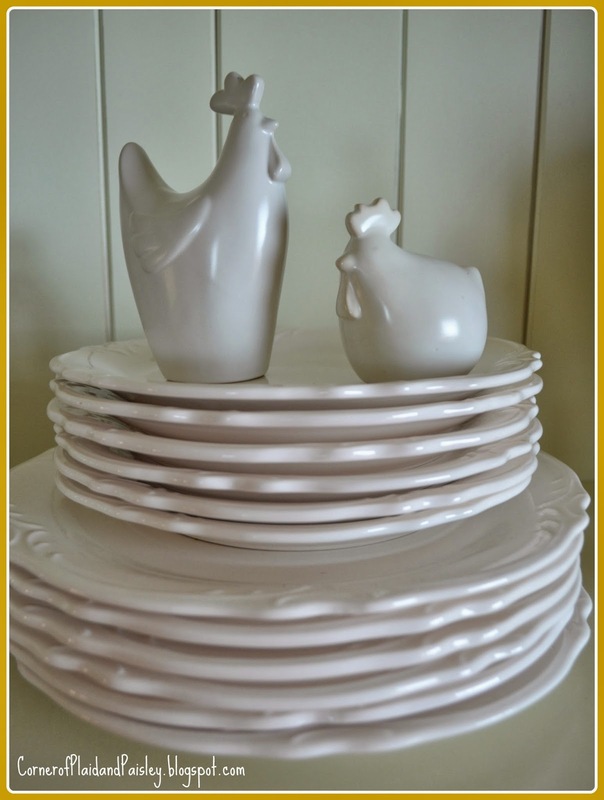 Love the regal hens as your centerpiece. At our age, we can squawk all we want! I have to tell you that I'm in love with those checked plates! Ann, I love this table and I hope you had a fabulous birthday! Oh how I like this table! It could be totally gross outside and sitting at this table, no one would know it! and those chickens are wonderful....they're like a modern version of those colorful ceramic ones. Love them! and love this yellow table, it is really beautiful and soooooooo cheery!